As an avid cyclist and someone who is passionate about reducing the foot pain of active British Columbians, I have a keen interest in Foot Health Tips for Cyclists. Here is a great article by British Cycling. In the article, the author explores important foot issues that pertain to cycling such as blisters and rubbing, hot-foot, the importance of cycling shoes and their proper fit, bike and cleat set-up, foot care and hygiene. Furthermore, this article is recommended reading for all cyclists whether short distance commuters or long distance road racers. I hope it helps to keep your feet pain-free in the pedals. Happy riding! Read the article here. 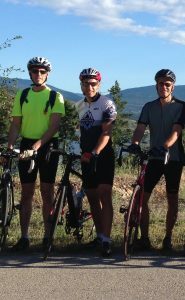 Dr. Mathews (middle) taking a break from a mountain climb in Kelowna at the 1st Annual Podiatry Conference ride.